He's a rag and bone man who obstinately couldn't care if you bought anything; a mad drunk on a binge. "Mule Variations" is a shambles. Tom rants and groans along that dusty road he oft sings from, with musical accompaniment limping behind him like a well-beaten dog. Like the ruined uncle you hero-worshipped as a kid, you'd never take his advice, but you love his turn of phrase and the romance of his dejection. Wrapped in ham-fisted guitars, a ruined voice, intrusive beats and a general sense of ill health, these beautifully crafted songs take us on a detour through the alleys and motels unvisited by teenage pop-stars and their flashy hygienic posturing. In a wilful rejection of the contemporary, he's made an effort to recreate the warmth and recording values of early blues recordings (this music would probably disappear on contact with modern radio compression techniques), but this only serves to disguise his hand. As often as he revisits the musical obsessions of the past, uses the same melodic and bluesy intonations of his earlier balladry ('Hold On', 'Georgie Lee'), he's also finding new ways to deliver his message. On "Mule Variations", he employs turntables and programming (on songs like 'Filipino Box Spring Hog') to the same effect as an under-paid blues combo. 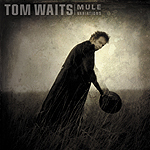 Typically, he never acknowledges or nods to this tacit acceptance of the contemporary, which makes "Mule Variations" both an antidote to nice-clean-electro-pop, and also a nice subversion of his anachronistic blues-man persona. So, by being complicated and contradictory, Tom helps make sure that the battered booze-hound is still relevant, still warming our hears, and still rewriting/sticking to the plot. The piano, sampler, A&R man and studio engineer have all been drinking, and like always, the truth comes out with drink. One more for the road Tom?